Steam moves in sports betting happen when large amounts of money come in on one side of a game, moving the line for that game collectively at sports books around the world. In this weekly feature we will examine an NFL game where a steam move took place and then give reasons to fade, or go against, the steam move. Game: Tampa Bay Buccaneers (0-4, 1-3 ATS) at Philadelphia Eagles (3-0, 2-1 ATS). Line: Opened at Eagles -12; Current is Eagles -14.5. Where the steam is coming from and why: Eagles bettors, and mostly because of Donovan McNabb and Brian Westbrook. Philadelphia's star quarterback and running back are both scheduled to return from injuries, giving bettors more reasons to put their money behind them and go against the dreadful Buccaneers. This is something bettors were likely to do regardless, but having McNabb and Westbrook return to the lineup makes the prospect of backing the Eagles that much more inviting. Under first-year coach Raheem Morris, the rebuilding Bucs have emerged as one of the league's worst teams in a year in which there is no shortage of them. They are ranked No. 27 in total offense and No. 31 in total defense out of 32 teams. Morris essentially conceded the season last week when he started rookie Josh Johnson at quarterback in the place of ineffective and immobile veteran Byron Leftwich. Johnson's mobility came in handy as he threw for 142 yards and ran for 56 more in Tampa Bay's 16-13 loss to the Washington Redskins. He had one touchdown and one interception. The Eagles, meanwhile, have looked good despite playing two of their three games without McNabb, who was injured in the season-opening road win over the Carolina Panthers. Backup quarterback Kevin Kolb was efficient but outgunned by Drew Brees and the New Orleans Saints before responding with a 34-14 win over the Kansas City Chiefs. The Eagles also have quietly put together the league's third-ranked defense. The case for going against the steam move: Because it's simply way too many points, and nobody ever made a living laying 14.5 points in an NFL game. The Eagles are not the best team in the NFL, and the Bucs are not the worst, though the spread would seem to suggest otherwise on both counts. Fading bad teams is a popular NFL betting strategy, and it might be more prevalent than ever, now that favorites have gone 21-9 ATS in the NFL over the past two weeks. You can expect this to change … quickly. The spreads are getting inflated like hot air balloons as oddsmakers become increasingly determined to avoid getting beat by popular home favorites. Because of this factor, there's probably at least three points of added value to this line. 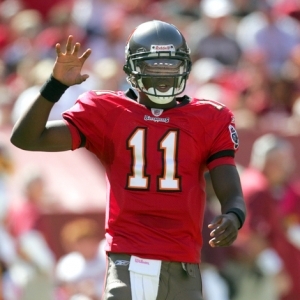 Moreover, the Bucs are 4-1-1 ATS in their last six road games as an underdog of 10.5 points or more. However, the Eagles are 4-0 ATS in their last four games as a home favorite. Pick to fade the steam: Tampa Bay +14.5.